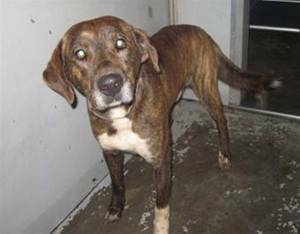 GREENVILLE, SC - I just love this humble, sweet, handsome 2 years old mastiff/plott hound mix named BRINDLE. He is an absolute gentle giant (approx 70lbs) and he has so much to offer to an adopter. He is kind, sweet and mellow. Brindle's owner stated that he is an excellent dog, but the owner just couldn't keep Brindle due to his dire financial circumstances. Brindle is very confused in the shelter, but he waits politely and calmly in his dark, small cement cell at GCACS. He has lovely manners and it clear that reality hasn't sunken in for him that his owner is not coming back :-(. Brindle is growing more and more depressed in the shelter as each day passes. Won't someone please get him out and give him the forever home he so desperately wants and deserves?!?! You won't be sorry! He's an awesome dog and he gets along great with other dogs, too! SAVE BRINDLE the UNDERDOG. Contact is the rescue coordinator, Taryn. Her email at the shelter isanimalcareservices@greenvillecounty.org. Brindle will be put down Tuesday or Wednesday (depends on space, but right now the shelter is FULL!). Please help right now!!!! Thank you! Save a Pet! Saves Lives!